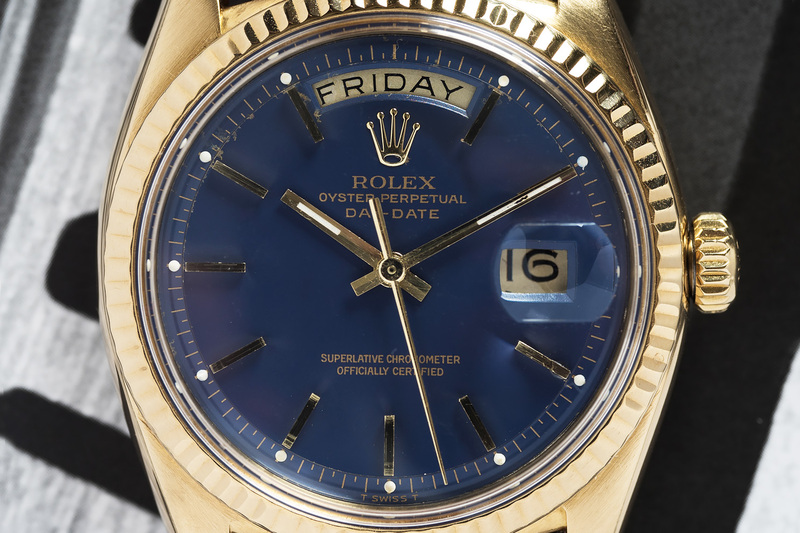 Like the Datejust, we are also big fans of the Rolex Day-Date, it was yours truly his first ever Rolex back in the late 1990’s, and even though that first one is now long gone, the love for the Day-Date absolutely remains and several Day-Date watches have past through my personal collection. 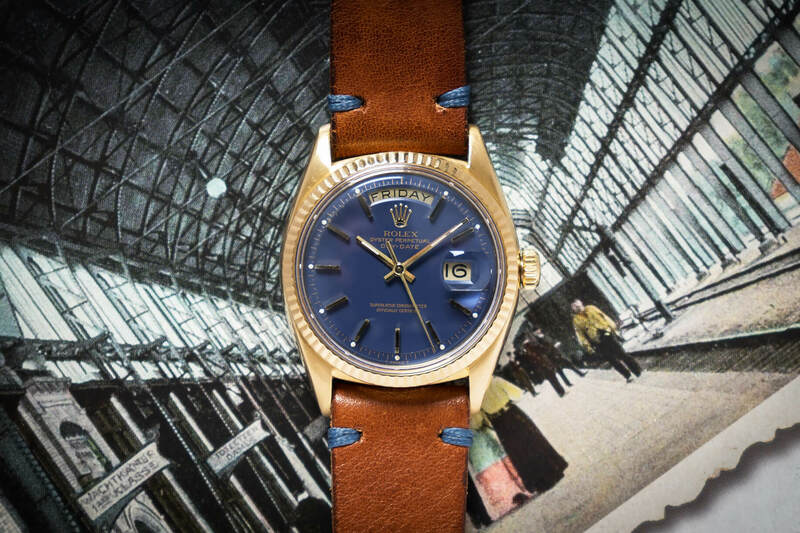 The Day-Date was first introduced to the market back in 1956 and was a pretty complicated wristwatch at the time. The Day-Date comes with an automatic movement, day and date disc and several ‘basic’ dials. Other Day-Date watches feature the most wonderful and elaborate of dials, sometimes set with diamonds and other precious stones. A variety of bracelets are available with (vintage) Day-Dates, with the ‘President’ bracelet being the most famous and recognizable one. Apart from dials being set with gemstones entire watches were also produced by Rolex fully flooded with diamonds and/or gemstones. 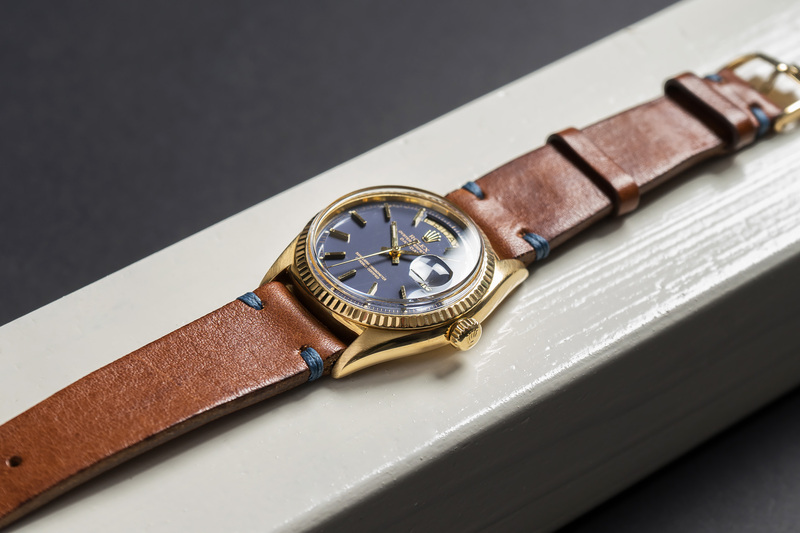 Back to our Day-Date, the watch we’re offering here is an 18c yellow gold, 1803 reference from 1976 and features a wonderful blue/lavender dial. 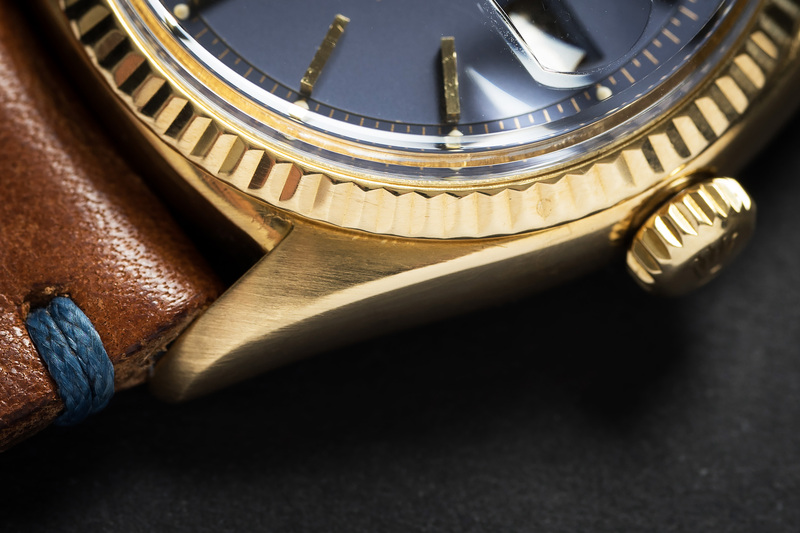 The dial probably started out as the color navy blue but due to the aging process of the dials paint and its varnish, it changed to this wonderful and warm tone. The combination of the gold printed text and the yellow gold hour markers are just perfect against the dial tone making it a rare appearance amongst the 1803’s available out there! 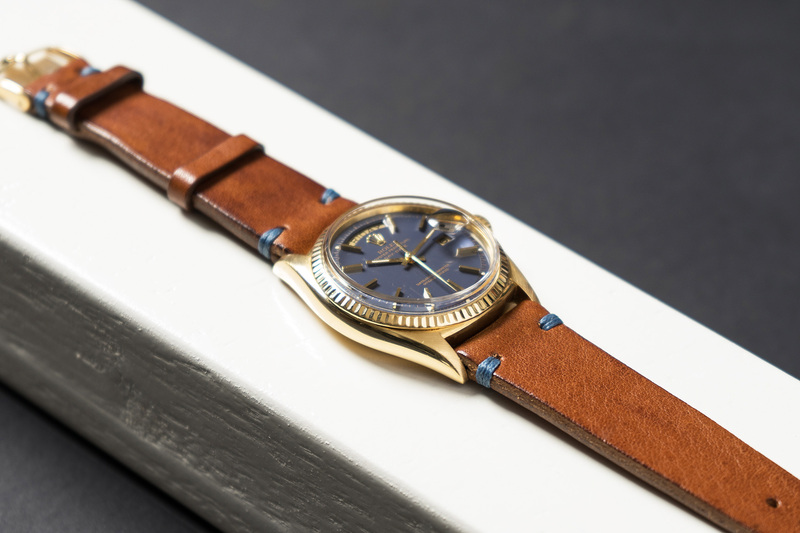 Within the 36mm range we feel that the Day-Date 1803 is one of the most beautiful vintage Rolex watches around, and priced well below the price of its bigger stainless steel brothers, like the vintage Submariner and GMT. 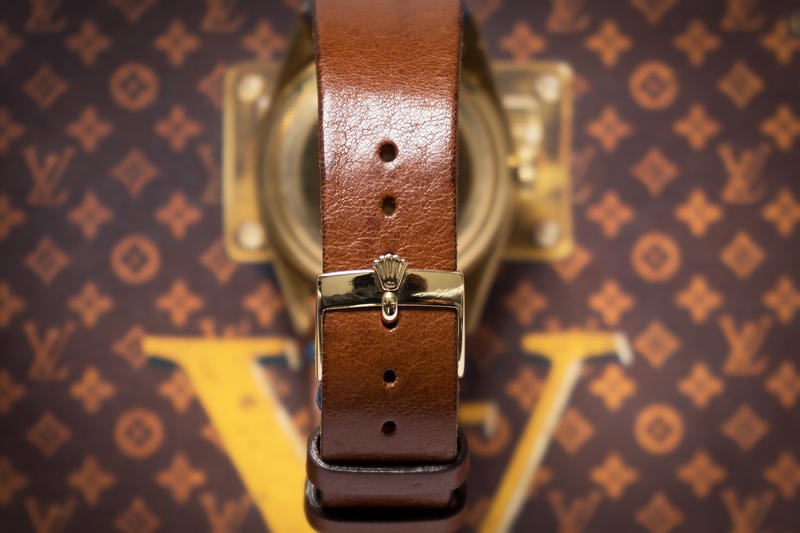 This 1803 is strapped on a handmade vintage bracelet with a rare 18c yellow gold, 16mm Vintage Rolex buckle attached to it! This is a watch you won’t regret buying! The Day-Date was completely serviced by our watchmakers and will be offered with a 12 month warranty.